It is due to some inexplicable reason that the Spitfire Mk. IX hasn’t been as popular with model manufacturers than its short-nose sibling, the Mk. V. Additionally, a Spitfire Mk. IX in 1/32 scale has been a verylong wait indeed. Recently, Pacific Coast Models released a modern kit of this mark in short-run injection-moulded plastic. Now, Tamiya tackles the same subject in their most important kit release of the year. 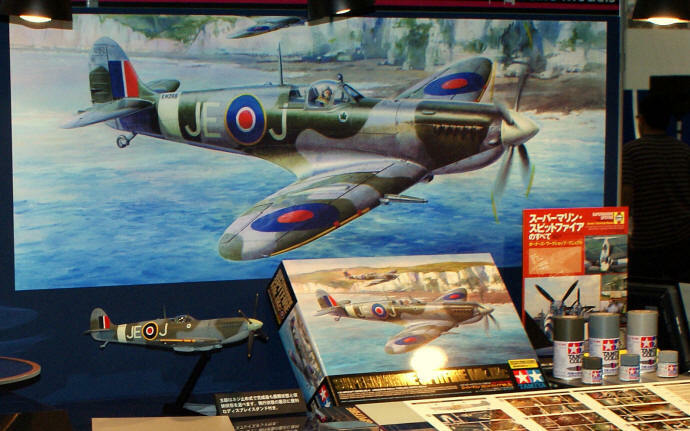 Tamiya took a no-holds-barred approach to this kit, which comes with a complete engine, detachable cowling panels, detailed cockpit interior, three choices of markings, two pilot figures and even a 16-page reference booklet with photographs of preserved Spitfires from various museums. 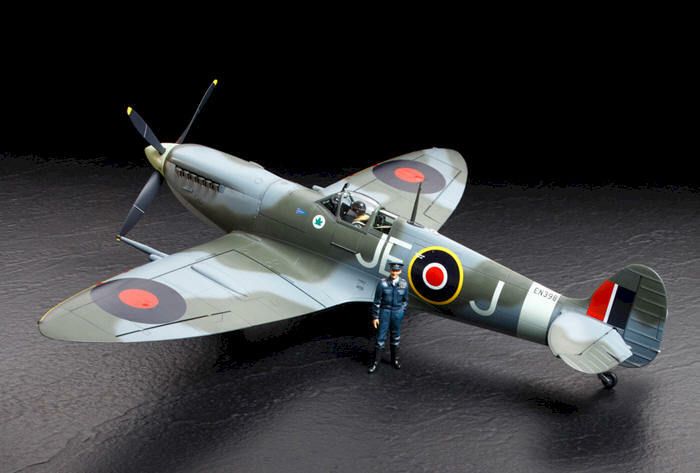 With this kit, Tamiya has had an ambition of covering the entire lineage of Spitfire Mk. IX, from early to late production variants. Doing so in a single kit is by no means an easy task, and frankly speaking, no other kit manufacturer has yet succeeded with such a challenge. Throughout its long production cycle, the Mk. IX underwent a myriad of minor external modifications beyond the usually quoted addition of a pointed rudder or clipped wings. It is the sum of these changes which, for example, makes Johnnie Johnson’s famous JE-J very different from any late-war Spitfire fighter-bomber. The Tamiya kit arrives in a large box adorned with golden print amd an air of luxury even compred to Tamiya’s other plastic kits. The evocative box art shows the arguably most famous Spitfire of them all, EN398 JE-J in flight along the cliffs of Dover. For the people of my generation, the artwork brings associations to the Airfix Spitfire of the 1960s. A nice touch and a reason for reflection upon the tremendous degree of development between these two kit offerings. Inside the box there are seventeen (!) sprues of light grey plastic, of superb moulding quality that Tamiya is rightfully famous for. Two clear sprues, rubber tyres, two sheets of photoetched parts, a large decal sheet, instruction and reference booklets. Surprisingly, there is also a display stand for the finished model, but this one is much smarter than the old Airfix stands, and can be used without marring the model with attachment slots. Has Tamiya’s attempt at faithfully reproducing this Mona Lisa of aircraft design produced desired results? We’ll see by examining the kit’s contents. Let’s go directly to the essence of this kit’s engineering. Here is what happens when one tries to cover all the variations on the Spitfire Mk. IX theme in a single package: dissected main kit components with a multitude of optional parts. While this kind of solution is a must to accommodate the various options, it will significantly add to the assembly time, increasing the risk of a mishap for a less experienced modeller. This kit is clearly not aimed at a total beginner. On the other hand, experienced modellers who would like to open and detail the armament bays will be able to do so without additional excessive surgery. In the wing parts, we can see provision for two different cannon bay blisters. 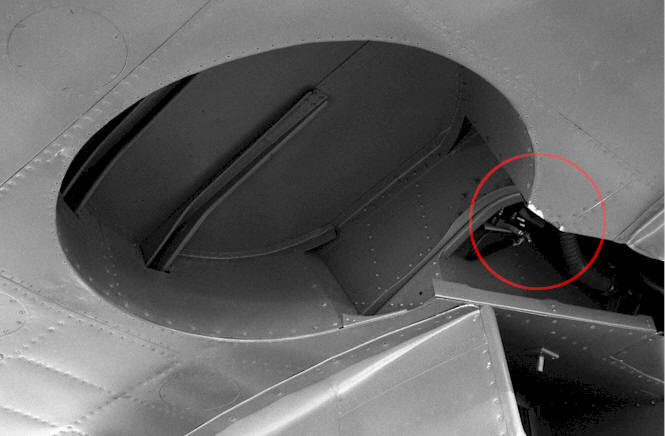 Opposing underwing panels have also changed during the lifetime of this mark, as did the spent cartridge chutes for the .303″ Brownings together with the upper cover overt the outer gun position. Tamiya has also provided leading-edge cannon and gun throughs as separate parts. Geting these parts to fit entirely flush with the leading edge will require sanding and filling. More options are discernible in the undercarriage cutout, where hollow inboard panels indicate provision for another option, small blisters introduced in later Mk. IX production when the undercarriage rotation pintle was strengthened and modified. Notably, the wheel well cut-outs in the kit are of early type, applicable for the initial style of undercarriage which was carried over from the Mk. VC. The later type of undercarriage received scissor links which required a bit more space to retract at the corner where the wheel and leg cutouts met. The kit correctly provides two correct styles of undercarriage doors, but the qing cutout conforms only to the early type, so here is the first compromise on the part of Tamiya. Correcting the wheel well opening for a link-type undercarriage is covered in the instructions, but will require using a knife and sanding stick – don’t forget it if it is applicable for your chosen Spitfire. Ailerons, elevators, flaps and rudder are all provided as separate parts. A choice of standard or pointed rudder is provided, as well as standard and enlarged-horn elevators. Compared to the wing, the fuselage halves have a more solid feeling about them, but modular engineering makes its presence through separate rear fuselage sides – possibly a trace of a forthcoming Mk. VIII with its retractable tail wheel. The cockpit entry door may be positioned opened or closed. The entire nose section forward of the firewall is provided as separate assembly which also includes the engine. We’ll have a closer look at it in the second part of this review. Fantastic kit. Overall detail and fit of parts is first class. The only downside are the decals, bin them and get an aftermarket set. I have almost completed mine and must say that this is without question one of the best aircraft kits out there bar none. Add a bit of plumbing to the engine and you have a real stunner. Yes an extraordinary kit, and about time we got a 1/32 Mk IX. Hoping to be able to get hold of a MK XVI at some stage, another Mk that was very rarely modelled. Well done Tamiya! Only odd thing are the large flat 20MM cannon blisters on the Mk IX, can’t recall ever seeing a photo or any museum or warbird spit with ones like that? Just bought this kit. Incredible detail, fit and finish. My only question is that the instrument decals appear just black discs on the sheet, which the instructions indicate would be the backing side. Are the instrument details on tghe other (paper) side, where we won’t see them until we slide them off? I’d hate to be wrong with a wet decal in my hand. Fear not, the dials are there on the other side. Some controversy about some of the colors, but very nicely done! Thanks, Michael – that’s a load off my mind. The instructions don’t give any hints.